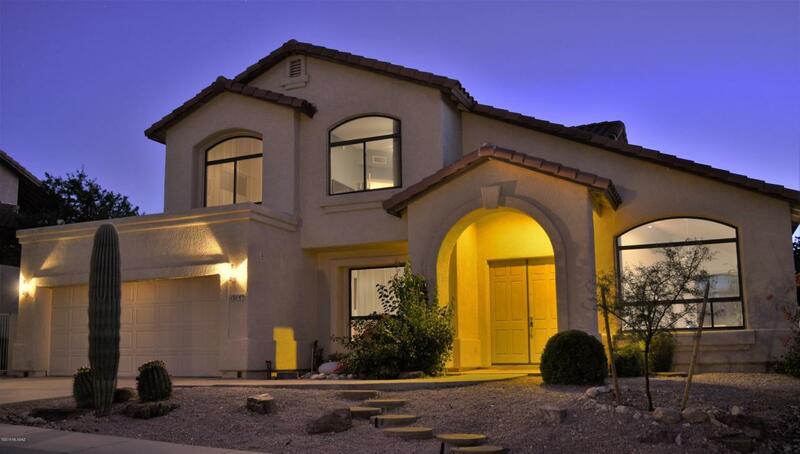 Stunning Northwest home surrounded by spectacular Catalina Mountain and natural desert views! Situated in the pristine guarded gate community of La Reserve, delivering privacy and breathtaking views. This fabulous home features high vaulted ceilings, remodeled kitchen with amazing quartz counter tops, delft tiles, breakfast bar, formal dining and spacious living rooms. Stainless Steel kitchen appliances all convey with the home! Outdoor paradise includes fully covered patio space, outdoor sink, kegerator, mini fridge and 2 grills! Mature landscaping includes edible fruit/citrus trees (see additional documents for a list). Close to shopping, restaurants and golfing! No polybutylene pipes, new AC installed upstairs, make this incredible home yours today!